Does it take forever to find the tool you want at the bottom of whatever plastic tub it's in? Do you have to carefully open garage cabinets because you're afraid you'll trigger an avalanche? It's easy for this area of the house to get neglected and disorganized. 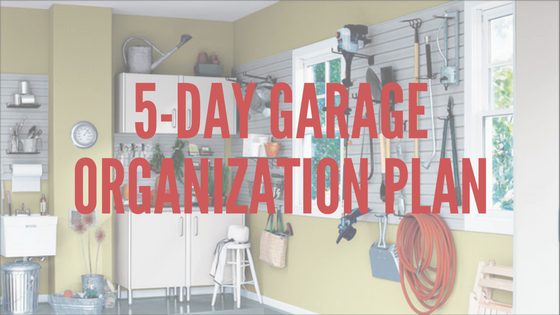 Our five-day garage organization plan can help you get this room into shape. Before you dig into the job, sit down with a pen and paper for some strategy. Sketch out a plan that shows how you want the garage to look when you are done. Are there items that you will need to buy for better storage? Bookmark listings for ones that you think you will need. It's better not to buy in advance, since you may wind up changing plans once you are deep into the job. Check the weather and your schedule, as well. You will need time free to take care of the task and temperatures and conditions that will make it possible. Set up several out of the way areas that will allow you to categorize items. You should have piles for items to sell, items to give away, those to keep and those to throw in the trash. If there are a few things you are on the fence about, put them in their own special "maybe" pile. With many things, you can afford to be brutal. Have a large item that you haven't used in years? If it is something you can easily acquire again if you need it, consider tossing it. The extra space you gain will pay off. Haul out things that are being tossed or given away right away. Many charities will come to your home to pick up donations, saving you a trip. While you have all of your stuff out of the garage, take some time to clean. Vacuum up dust and dirt and mop up any stains. Inspect the garage during this time. Do any necessary repairs before moving on to the next step. Finally, throw away any garbage that was not tossed out during step two. This can help make it easier for you to organize what is left. Now that you know what you are keeping, you are in a better place to make decisions about storage. 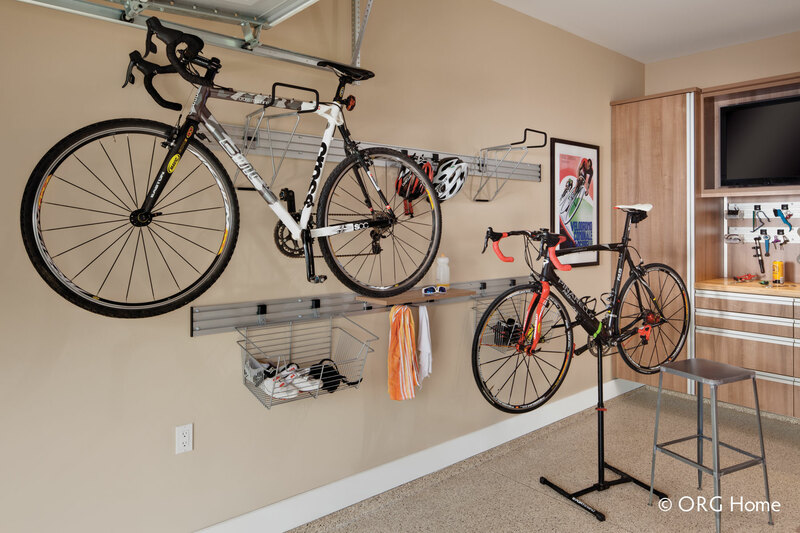 Everything you keep in the garage should have a space of its own. In some cases, organizational tools that you already have can do the job. Most people will find that they need to pick up something new to make their garage a practical and organized place. 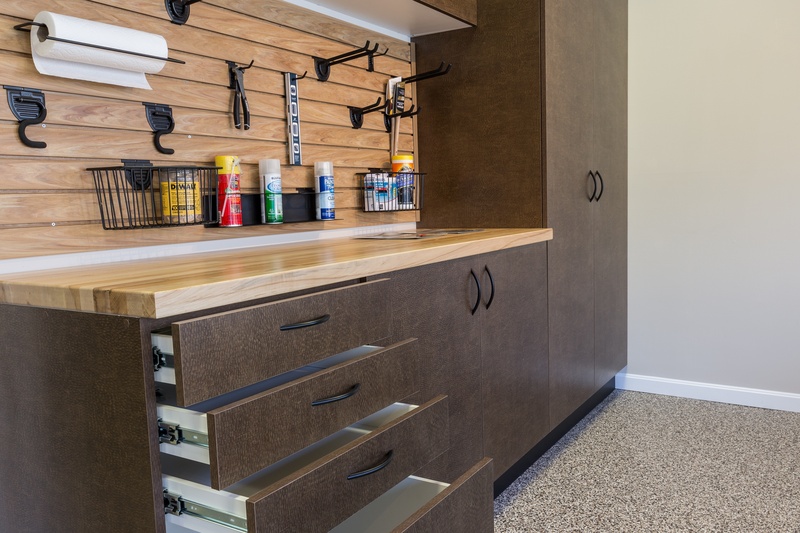 Custom garage cabinets are a great option for corralling your unique collection of tools, toys and other items that live in the garage. While it will take longer to wait for a custom cabinet, the payoff is that you will have storage solutions designed specifically with your needs in mind. Consult with a designer to find out how much custom cabinetry would cost and what sorts of designs are available. Often, you will find that the money you spend pays itself back in the time you save when you are using your garage after the redesign. Items on the floor of your garage take up valuable space. They are hard to keep clean and organized. It's all to common for the possessions that live on the floor to wind up hidden at the bottom of a pile. Start looking at the walls and ceiling to decide how you are going to utilize them. Using vertical space allows you to keep things accessible and in view. Many people discover that they have the room for one or both cars in the garage once they start removing unneeded items and properly stowing the ones that they keep. A combination of wall racks and hooks can get your most used items up and out of the way but keep them where you can easily find them. Other items, such as seasonal decor, can go in overhead storage bins. Up there, they are out of the way throughout the year and protected from the elements far better than they would be in cardboard boxes on the floor. When taking on an ambitious project like a full garage reorganization, there will also be a few tasks left undone. Go through the "sell" pile and take photographs and start listing the items on craigslist or eBay. Bring any specific "donate" items to the charities or friends they are meant for. Sweep up any sawdust or debris that collected after the cleaning day. If you find that you have everything covered, take some time to revel in your newly cleaned and organized space. A deep cleaning and reorganization of your garage can seem like a big task. By breaking it down into day-by-day chores, you can handle a little at a time and make it more manageable. While many dread the idea of digging into their garages to get them more organized, this is a job that can pay off huge dividends. You'll find that you are less likely to buy a tool that you already have because you can't find it. You'll start your evenings coming home and entering a well-organized space, which can help you settle in and relax. You'll find that you use your work areas more because they are easy to work in. By putting aside the time for the reorganization now, you will enjoy the benefit for months or years to come.